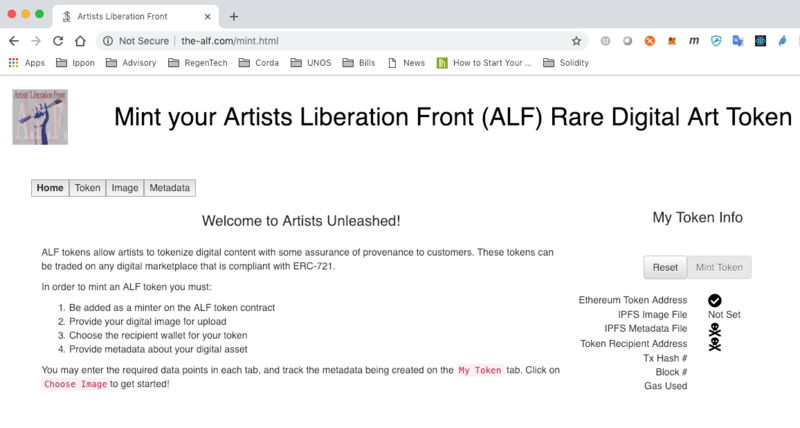 In this post, I will explain a bit about Non-Fungible Tokens (NFTs) and walk through an implementation of the ERC-721 standard in Ethereum. If you're looking for a non-technical intro to blockchain, check out my friend Johnny Dollar's explanation, and follow up with a more in-depth explanation from Andreas Antonopoulos. If you want to ramp up on developing software on Ethereum with Solidity and Truffle, read Tyler Haden's posts on Solidity and Truffle. Most people think of blockchains as cryptocurrencies, but open, distributed ledgers are a great way to track many kinds of assets. Think of tokens as poker chips that can be traded in a marketplace without hauling the physical assets around. When you hold digital tokens, you have cryptographic security and 24/7 access to exchanges to buy/sell. Unlike poker chips, blockchain tokens do not require you to trust "the house". Vires in numeris! When discussing token standards on the Ethereum network, usually the first thing that comes to mind is ERC-20, the fungible token standard. ERC-20 is fungible because every token is the same as every other token. This is why so many startups were using ERC-20 tokens to kick start their projects during the ICO craze; they were (mostly) tokenizing their business ventures, products, or services and selling pieces of the value. Side note: "Fungibility" is often touted as a desirable trait in assets, but it's more complicated than it seems to create truly fungible assets. Gold is one of the best examples, because it can be smelted and reshaped with only weight and purity as variables, but what about modern money? 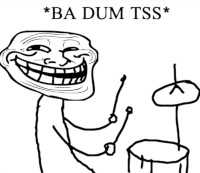 Are all US Dollar bills the same? Almost; there are those pesky serial numbers which can be used to track bad actors like bank robbers. Are Bitcoins fungible? Same problem as USD, each and every Bitcoin transaction has a unique ID and can be traced back to its origin. If you require near-perfect fungibility, use Monero. The advent of ERC-20 opened a Pandora's Box of differing requirements for tokens. Check Ethereum's site for an exhaustive list. For this post, I'm focusing on ERC-721: non-fungible tokens. There are many assets one could "digitize", or at least create a tradable digital proxy, which are unique in some respect. Event tickets often have a particular seat associated with each ticket; real estate parcels have unique location and characteristics; virtual items in online games are often unique (sometimes terminally unique); art and music are particularly good use cases, because uniqueness is part of their intrinsic value. When you purchase a painting or sculpture, there are usually documents or other artifacts to assure you of their provenance and authenticity. ERC-721 attempts to provide these assurances by associating the digital token with digital metadata. Let's dig in and see how that works under the covers. Since Ethereum is a smart contract platform, token implementations are interfaces which define functions that must be implemented. Like ERC-20, your implementation of these functions defines the behavior of tokens minted from the contract during transactions. The key to minting NFTs for marketplaces like OpenSea and Rarebits is the tokenURI used here. This allows the inclusion of metadata which references the source of truth for a digital art asset. Let's dig in to our use case and explore how metadata drives NFT markets. As is often the case in emerging technologies, the most prevalent use cases for non-fungible tokens emerging to date are in art and gaming. I was approached by my pal Johnny Dollar for help implementing and deploying an NFT contract. Johnny wanted to provide digital artists with an open source solution for minting NFTs for digital art. 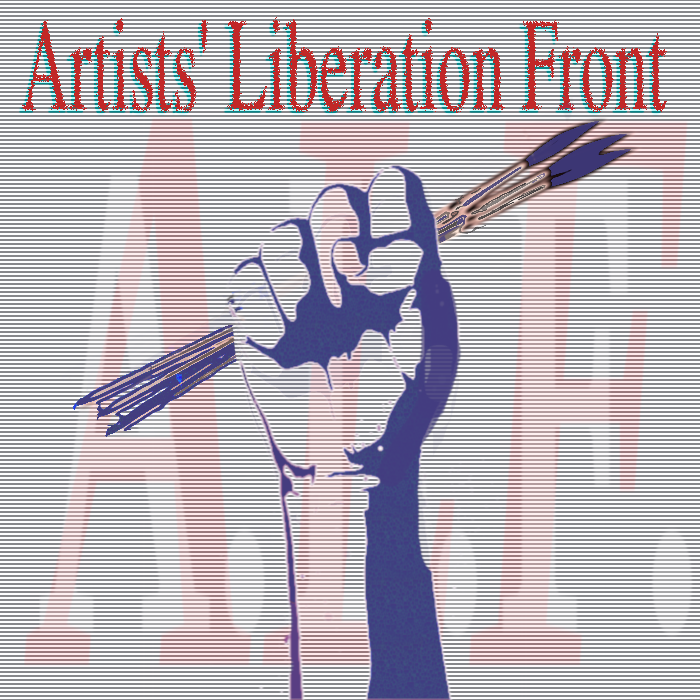 Thus the Artist Liberation Front was born! 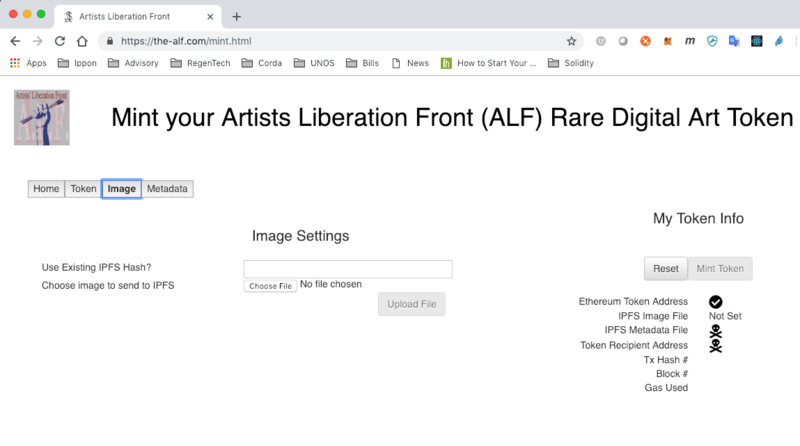 The goal of ALF is to make it easy for artists to mint non-fungible tokens without paying fees using open source software. The user interface isn't anything fancy; I'm no UI designer. 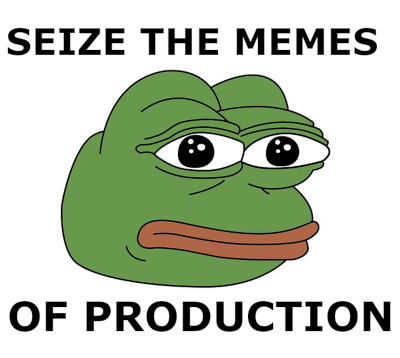 It's just simple, and it works. There are many features we'd like to add as we get feedback from artists using the tool. All source code included here can be found at the ALF Github repo unless otherwise specified. I began by researching the example code at OpenSea, one of the most popular marketplaces for NFT digital collectibles. Note our addition of new attributes; these are traits often associated with physical works of art. 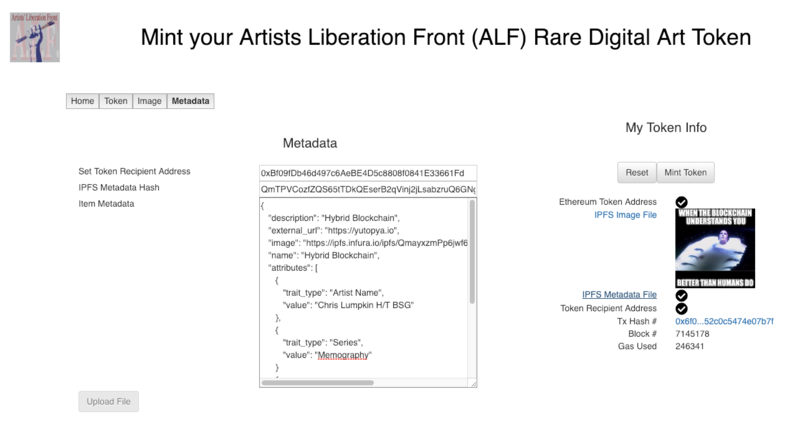 As standards evolve in the NFT space, I hope the most relevant types of metadata will emerge and be widely adopted and used by NFT marketplaces and galleries. The following is for those familiar with Solidity and Truffle. The ALF contract was originally based on the OpenSea Creatures demo project. I upgraded some dependencies and code to take advantage of fixes and features in OpenZeppelin-Solidity 2.x. OwnableDelegateProxy and ProxyRegistry are used to whitelist our contract with OpenSea's proxy registry for trading on their market. * TradeableERC721Token - ERC721 contract that whitelists a trading address, and has minting functionality. ERC721Pausable allows us to pause our contract if something goes wrong. TAKE NOTE that this not only pauses minting new tokens, but also transfer of existing tokens! In the constructor we initialize our token contract metadata and set our proxy registry address. We will use the proxy registry later to verify who is permitted to list a token on the owner's behalf. * Override isApprovedForAll to whitelist user's OpenSea proxy accounts to enable gas-less listings. // Whitelist OpenSea proxy contract for easy trading. This is where that proxy registry address comes in, allowing a user's token to be listed and traded on OpenSea's NFT collectible marketplace. The mint function allows our minter to pass in the address they're minting to and the token URI that resolves to the metadata file for this token. Here we're ensuring our token ID is unique, and reflects the order in which it was created. Now that we made the baseline contract, our actual token contract is just a one-liner constructor! // OpenSea proxy registry addresses for rinkeby and mainnet. There is still a lot of code, so I'm only going to highlight the most critical parts. You can browse the rest in the ALF Github repo. The Token tab exposes settings used for the IPFS gateway and token contract. We're storing the unique image on the Interplanetary File System (IPFS) because the blockchain is not efficient for (or in some cases capable of) storing large binary files. You can read more about IPFS on their site. Now we get to the fun part: uploading our image and metadata to IPFS! Click the Choose File button for file picker dialog. Once you've chosen a file, the Upload File button is enabled. 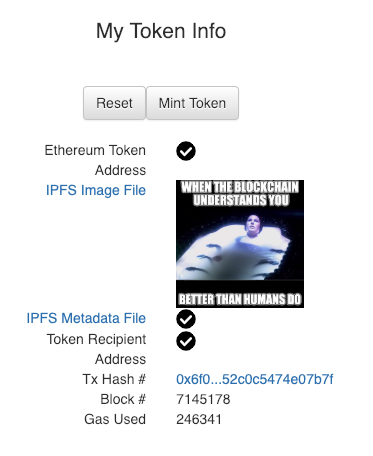 Note in above that the IPFS image is displayed in the status block on the right. One of the great features of IPFS is that you cannot upload duplicate images, because every image is located using the hash of the file, and guess what happens if you hash the same file more than once? That's right folks, you get the same hash. Note the await modifiers; Ethereum transactions are not real-time, so these are async calls. Caveat #13,427: you must have been added as a minter for this token using the addMinter function! 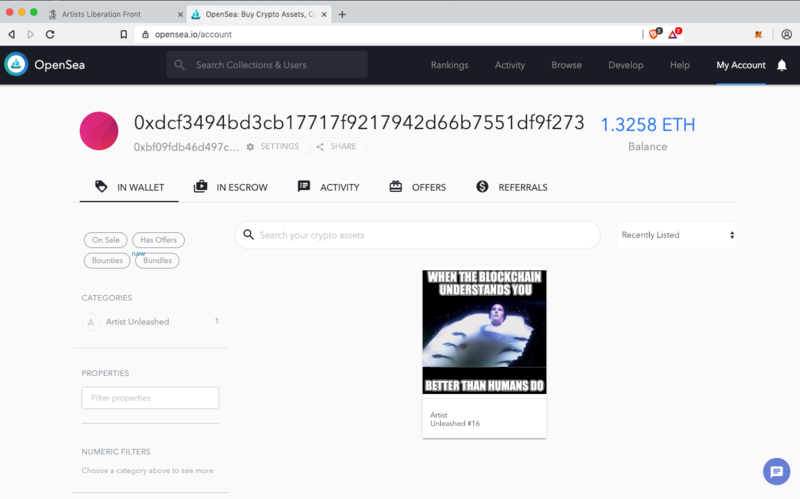 I waited a few minutes for my transaction to be mined on Ethereum, then I headed to https://opensea.io/account and my shiny new ERC-721 token had appeared! Non-fungible tokens present some interesting opportunities in tokenization; fungibility isn't for everything. ...not everything needs to be tokenized. It's fun to work with the pioneers from the art and gaming worlds and explore how this technology can be applied to both digital and physical assets. I find it a bit inconsistent that we're minting tokens on a distributed ledger using a distributed file system, yet we're using old school centralized DNS to reference our metadata and images via IPFS gateways. This could be remedied with an oracle (not that Oracle!) 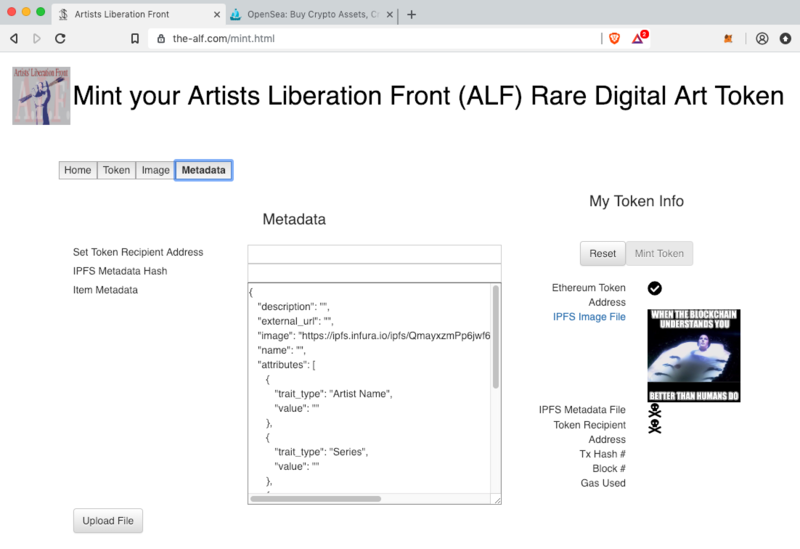 on the blockchain to locate the metadata and image files. 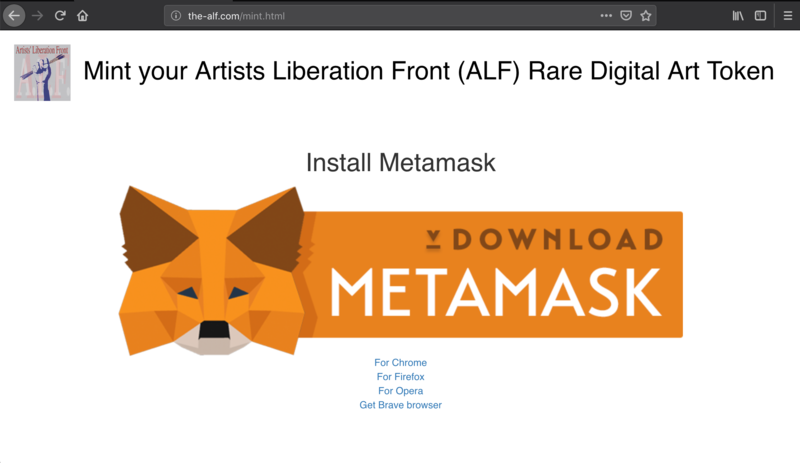 If this was implemented, then perhaps the organizations involved with NFTs would agree to a new standard where the IPFS hash of the metadata is stored in the token, rather than the URI, and similarly, the IPFS hash of the image is stored in the metadata. 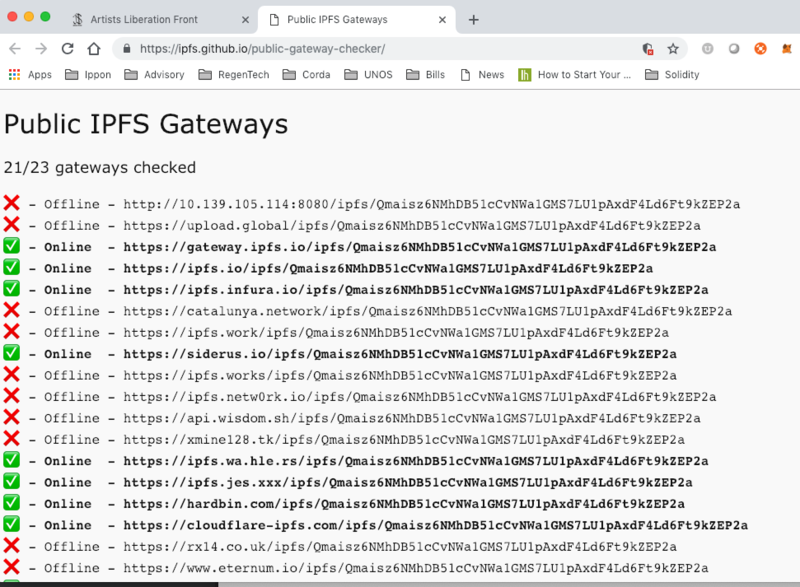 This way, we could at least hedge our reliance on a single DNS domain by allowing the oracle to determine which IPFS gateway is appropriate at the time the image is requested. 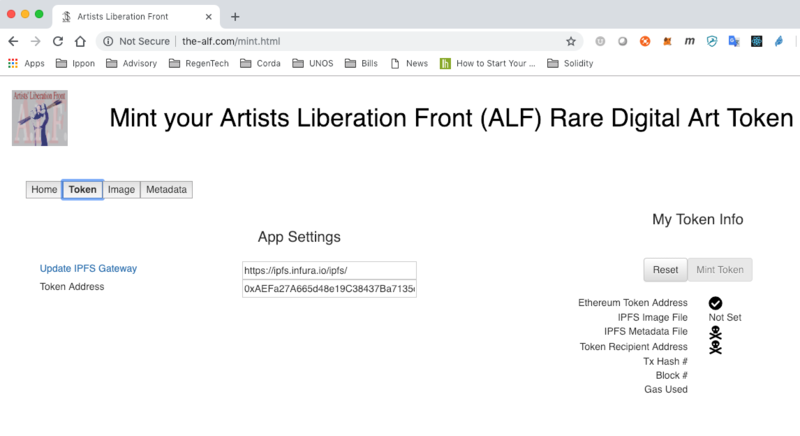 If you're interested in minting ALF tokens, join the ALF Telegram channel and send us your Ethereum wallet address! Blockchain evangelist and solutions architect with experience in full stack Java and DevOps.